This lesson introduces learners to the uncertainty and errors in forecasting the track, timing, and intensity of tropical cyclones. It provides an overview of how the National Hurricane Center’s cone of uncertainty is constructed, as well as its uses and common misconceptions. Learners will explore the influences of track, timing, and intensity forecast errors on potential tropical cyclones impacts. The lesson offers suggestions on how to communicate tropical cyclone forecasts knowing their inherent uncertainty. This module did an excellent job of describing how to communicate uncertainty in tropical cyclone forecasts, as well as the average errors for tropical cyclone forecasts at given times. Simple, easy, and straight to the point. One of the most effective modules in my opinion. Contains information on NWS forecast products. Some of the information is a little outdated as the NWS has recently updated some of the forecast products including the cone of uncertainty. 5 stars. What I am realizing taking these courses is that forecasting is defined by possibilities supported by computer models, and other forecasting tools. There is nothing definitive before damage occurs until after the storm. Very nicely organized and quick module that characterizes the makeup, intent and misconceptions about the NHC tropical cyclone forecast uncertainty cone. 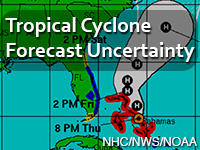 It should be useful to anyone who makes use of this NHC product. October 2018 The module was updated to reflect the current state of the NHC and NWS products related to the cone of uncertainty and the latest NHC forecast verification information.